When deciding columns, the first order should be the classical order. 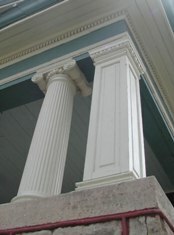 The classical order is one of the ancient styles of building design that is recognizable by the type of column and capital. 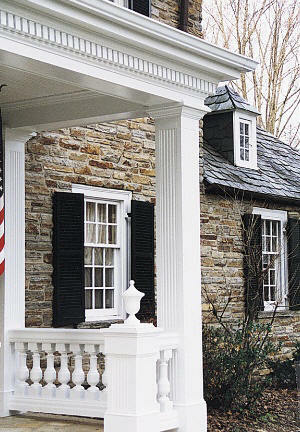 Classical columns are seen everywhere, on porches, entryways, or holding up a balcony, you probably just didn’t know their history. From the sixteenth century onwards, there have been five recognized orders. All of these originated among the Greek architects and were modified by others, particularly the Romans who took column structures to a beautiful art. 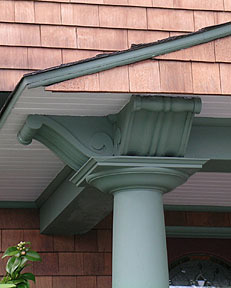 A column is divided into three parts- the base, shaft, and capital. The easiest way to distinguish between the classical orders is the capital. 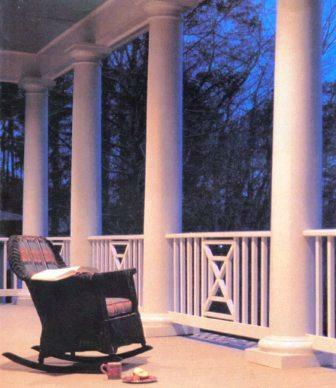 The horizontal structure that is supported on the columns like a beam is called an entablature. The entablature is commonly divided into the architrave, the frieze and the cornice and each style has its own individuality. The stylobate is the flat pavement on which the columns are placed. On the stylobate is a square or circular block called a plinth. Above the plinth there may be another with molding profiles. These profiles are commonly the convex torus and the concave scotia, separated by fillets or bands. On top of the base is the column proper, or shaft. Long and narrow, shaft heights are determined and measured as a ratio between the diameter of the shaft at its base to its height. The shaft is sometimes fluted or carved. The capital sits at the top of the shaft. It is the capital that distinguishes the column orders from each other. 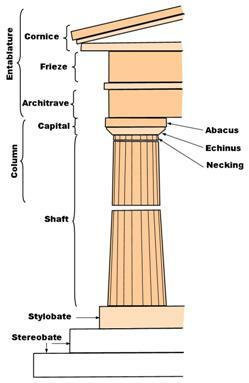 The capital is composed of three parts, the necking which sets on the shaft and has one or more grooves, the echinus which sets upon the necking and is a circular block, or large torus, and supports the abacus, which is a square or shaped block that in turn supports the entablature. 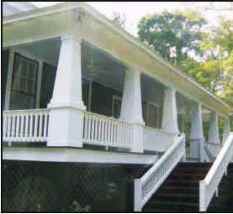 The entablature is the horizontal beam on top of the columns. It consists of three vertical layers which are separated from each other using moldings. The three layers have distinct names: the architrave is at the bottom, the frieze is in the middle and the molded cornice lies on the top. In some work the entablature may be an arch. The entabulature is distinct to the column style. 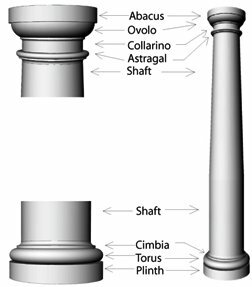 The Doric order is the oldest and is composed of a tapered shaft most often fluted. There is no base or capital in the Greek designs but the Romans used a base. The top is often an inverted, shallow frustum or a carved torus. The height-to-thickness ratio is about 8:1. Also a simple design, the Tuscan shaft is almost always smooth. The base and capital are cylindrical disks of alternating diameter. The height to thickness ratio is about 7:1. Because of the simple design of the style it was easily adopted by carpenters and became a distinguishing mark of the Georgian style. The Ionic column is more complex and decorated. The base is a astragal and torus and the shaft is often fluted. The capital has a volute at the four corners. The height-to-thickness ratio is around 9:1. 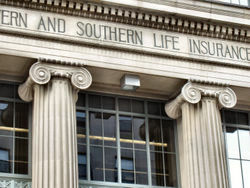 The Ionic column is sometimes associated with academic buildings. 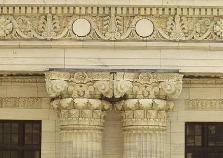 The Corinthian capital uses no neck and instead has a ring-like astragal molding forming the base of the capital. There is an abacus on the capital which has concave sides that conform to the scrolling corners. There may also be a rosette at the center or each side. A freeborn maiden of Corinth, just of marriageable age, was attacked by an illness and passed away. After her burial, her nurse, collecting a few little things which used to give the girl pleasure while she was alive, put them in a basket, carried it to the tomb, and laid it on top thereof, covering it with a roof-tile so that the things might last longer in the open air. click to enlarge This basket happened to be placed just above the root of an acanthus. The acanthus root, pressed down meanwhile though it was by the weight, when springtime came round put forth leaves and stalks in the middle, and the stalks, growing up along the sides of the basket, and pressed out by the corners of the tile through the compulsion of its weight, were forced to bend into volutes at the outer edges. 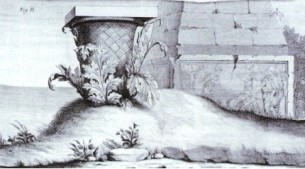 Just then Callimachus, whom the Athenians called katatêxitechnos for the refinement and delicacy of his artistic work, passed by this tomb and observed the basket with the tender young leaves growing round it. Delighted with the novel style and form, he built some columns after that pattern for the Corinthians, determined their symmetrical proportions, and established from that time forth the rules to be followed in finished works of the Corinthian order. The oldest known Corinthian capital was dated at 427 BC. It is the slenderest column with a ratio 10:1. The base is similar to the Ionic base but the capital is the most decorative of the orders. Richly carved it projects a very expensive, elaborate air. Composite order The Composite order is a composite of the Ionic and Corinthian capitals. The acanthus of the Corinthian column already has a scroll-like element, so the distinction is sometimes subtle but the composite volutes are larger mand the echinus is decorated with egg-and-dart ornamentation between the volutes. The column of the composite order is ten - 12 diameters high. At least honorable mention must be given to the Solomonic column, which was the invention of Baroque architects in Europe. click to enlarge They were called “Solomonic” because they were based on a description of columns in the great temple of King Solomon in the Old Testament. 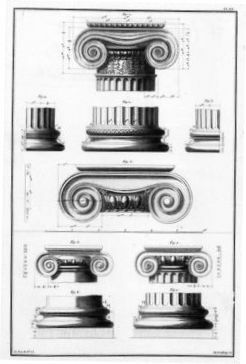 click to enlarge A Solomonic column has a base and ends in a capital like a classical column, but the shaft twists around the shape of the column. The most famous use of Solomonic columns is in the baldocchino designed by Bernini for Saint Peter’s Basilica in the Vatican City. As mention previously the Solomonic column was revived as a feature of Baroque architecture. Used infrequently in Britain the columns became popular in Catholic Europe. The Solomonic column spread to Spain and from Spain to Spanish colonies in the Americas. After 1660, such spiraled columns became a familiar feature in the legs of French, Dutch and English furniture. (aka) Your everyday present mode columns. Forshortened but relatively common.A Tuscan column. It has all the parts of classical order column and even sits on a stylobate. I belive this is what was called a Georgian column. 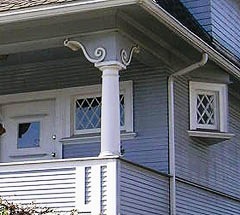 A nice set of tapered Arts & crafts columns on a Bungalow. 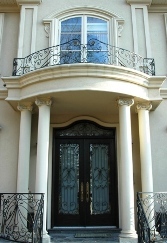 A different size Tuscan with heavy carved balusters. These are fiberglass. A perfect example of an Arts & Crafts capital sitting on a Tuscan or a non-fluted Dorian column. The Echinus is common but I have not found any discription of its style. Another Tuscan with a Arts & Crafts house. Notice the diamond mullion glass in the windows and the canted side stairway window. 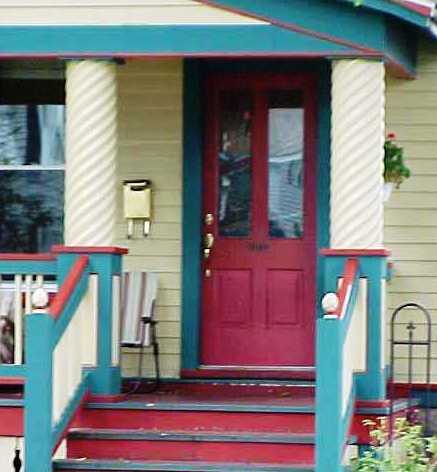 The trim below the porch edge is interesting. And the carved capital, the white curly-que design is called a 'Swans neck'. I don't think you can call this a Solomonic column. It's either a culvert pipe painted or a concrete caste piece. I think a heavier abacus and stylobate and a thinner diameter would be very attractive. Tall Tuscan columns. This shows what a difference a tall column makes to a space. A very nice bungalow with multiple square columns. The curved skirt is called a 'Belcast'. The Bargeboard with the Torus Plate on the end is unique. 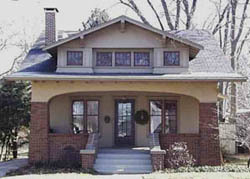 A Craftsman porch with a long arched entablature sprung in tapered brick columns. 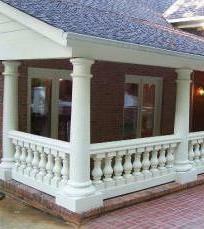 Whats different about this design is the columns start at grade and not at the porch level. It looks like an late 1800's house. 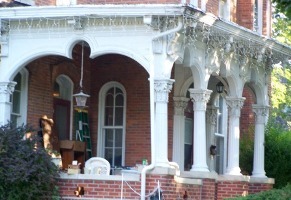 Twin Ionic capitals at twin sidelights and the porch is Tuscan columns. The entablature at the doorway are very heavy with a large cornice molding. An Antebellum period home. Very tall and slender Ionic columns. 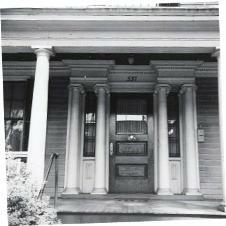 Four Ionic columns flanking an entry portico. Nice curved entablature with heavy cornice making a balcony. Good wirework. A beautiful set of columns. 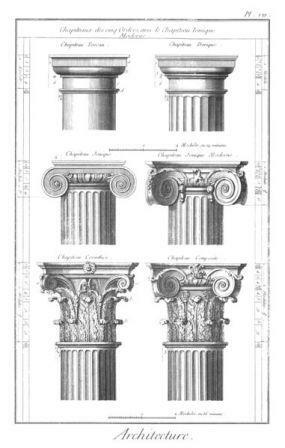 The left is a very traditional, full scroll ionic, fluted column with the egg & dart echinus. The twin square paneled column is tied with the egg & dart at the echinus also. Notice the small beaded chaplet at the bottom of the echinus. A nicely colored entablature corniced with dental mold. A nice old stone corinthian with a banded entablature. The highly decorative freize is bubeautiful capped with dental. 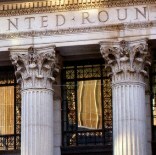 A nice set of corinthian columns under a curved entablature. Beautiful corinthians on a home porch. Nice heavy, arched entablature. The 3/4 circle in the arch is very nice. 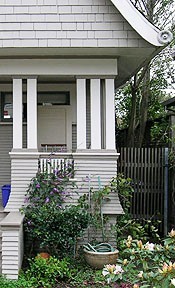 At the back of the porch there's a nice example of an engaged square corinthian pilaster. Notice the arched panes in the arched window. This is an entry. Slender, fluted Dorian columns with arched entablature. 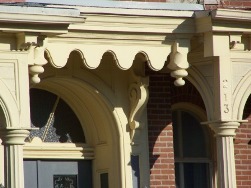 The four-lobbed spandrel with dropped pendants. Swans-neck corbels on a deep, paneled transom.